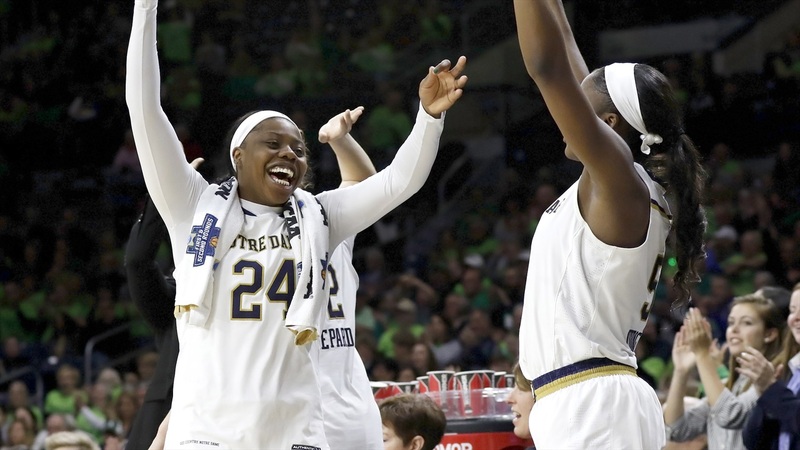 Notre Dame stretched its current winning streak to 12 games with an 87-80 win over Texas A&M to advance to the finals of the Chicago Regional Monday night. The Irish took firm control in the first half of each of the first eleven games of the current streak and coasted to win after win. Texas A&M was a different story. The Aggies used a 35-point effort from star guard, Chennedy Carter, to keep the game close into the fourth quarter. Carter was unconscious from beyond the arc. She hit 7 of 12 - 58.3%. Before today’s game, she averaged 1.5 made threes a game and made 33% of her attempts. Carter only made 6 of 22 shots inside the three point line. Arike Ogunbowale kept pace with Carter with a career-high 34 points, and outscored Carter in the second half 24 to 19. Ogunbowale only made 1 of her 6 three point attempts, but was an efficient 13 for 20 on her two-point attempts. She was 5 for 6 from the line, grabbed five rebounds, and had four assists and three steals. The Aggies attacked the glass in the first half and grabbed five offensive rebounds leading to easy put backs — the last coming just before the end of the half to knot the score at 42 heading into the break. A&M had 15 second chance points in the game to 12 for the Irish. The Irish used the one-two inside punch of Jess Shepard and Brianna Turner to score 25 points in the first half, but only had a 20 to 18 rebounding edge before the break. In the second half, the Irish out rebounded the Aggies 25 to 10 and limited the A&M second chance opportunities. Texas A&M shot 51.4% in the first half, but cooled off to 40.6% in the second half, and ended the game at 46.4%. For the first time since losing to Miami on February 7th, the Irish faced late game pressure and responded by shooting 57.1% from the field and making all five free throw attempts in the fourth quarter. For the game, the Irish made 52.2% of their field goal attempts and 13 of 15 free throws (86.7%). Shepard had another standout game with 24 points. She played all 40 minutes, shot 11 for 18 from the field, grabbed 14 rebounds, and had 6 assists and a steal. Turner scored 12 — but just two in the second half. She blocked 4 shots and collected 6 rebounds. Jackie Young ran into a mid-court screen early in the second half, and was down on the court for a minute or two before going to the bench. She came back to play 37 minutes, and guarded Carter most of the game. Young made several key baskets late in the game to finish with 14 points, eight rebounds and two assists. Kayla Wells, the Aggies second leading scorer on the year, scored 18 in 40 minutes of action. Ciera Johnson, the 6’4” transfer center from Louisville, was the Aggies’ only other double figure scorer with 12. She did have three blocks and 12 rebounds. Marina Mabrey had another difficult shooting night — just 1 for 5 from the field. She did make a three pointer — her first since the ACC Tournament final against Louisville. Mabrey did contribute with 6 rebounds, 6 assists and no turnovers. The Irish only made 2 of 10 three point attempts, but were 34 for 59 (57.6%) inside the arc. The Aggies only made 46% of their two point attempts. The Irish had 20 assists and 9 turnovers. The Aggies only managed 10 assists against 7 giveaways. In the second game in Chicago, 11 seed Missouri State played a spirited game against Stanford before losing 55 to 46. The Irish will play the Cardinals Monday night for a trip to Tampa and the Final Four. This will be the third time in the last four seasons that both teams have squared off in the NCAA regionals. Stanford edged the Irish in the Elite Eight two seasons ago 76-75 when Ongunbowale missed a last second attempt to send the Irish to the Final Four. The Irish were playing without Turner, who tore her ACL in the second round game. Three years ago, Stanford beat the Irish 90 to 84 in the Sweet Sixteen. Monday’s game is scheduled for a 9pm eastern tip-off.